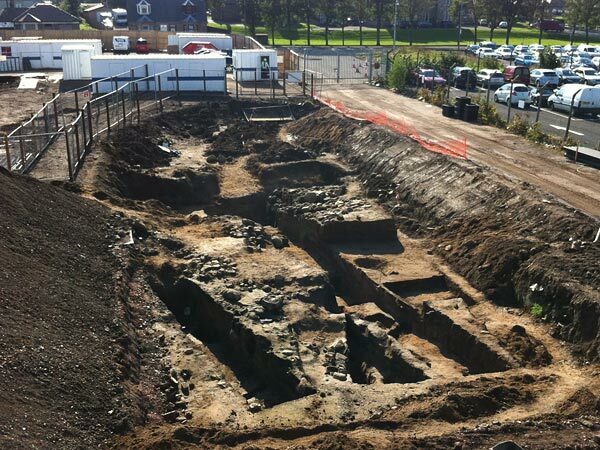 A new roman fort has been discovered at Falkirk in Great Britain. Archeologists say they have found evidence of at least two Roman forts dating back to the first and second centuries AD that would have been used when the Antonine Wall was built. Archaeologist Martin Cook who is working on the project said the find is one of the most important in the Falkirk area for “decades”. 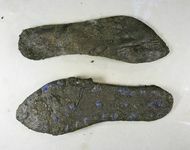 Among the artefacts dug up are bones, jewellery, ceramics, ovens, coins, but, what makes this discovery amazing are the up to 60 couples of leather shoes. The Camelon site, home to the former Wrangler factory, is being cleared to make way for a Tesco store by contractors Barr Construction. AOC Archaeology, which excavated the land for them, uncovered a rich bounty of archaeological relics. Mr Cook said: “This will be one of the most important finds in the Falkirk area for decades and one of the best ones we’ve been involved with. It’s hugely exciting “We found some Samian pottery from France, more than we expected to find. There were coins, trumpet brooches and 60 pairs of leather shoes in the ditch, something we really didn’t expect and which is hugely important statistically. The new Tesco supermarket is to be built on the east side of the site to allow the archaeology to be preserved under new car parks. Falkirk Council’s keeper of archaeology and local history, Geoff Bailey is hopeful the arrtefacts will stay in Falkirk once they’ve been examined. He said: “The Camelon site is the most important we have in the Falkirk area and is of major significance. Sites like these don’t come up very often. Examples of some of the artefacts and photographs are on public display in a portable cabin on site. A sight of the excavations. Some shoes found in the fort.